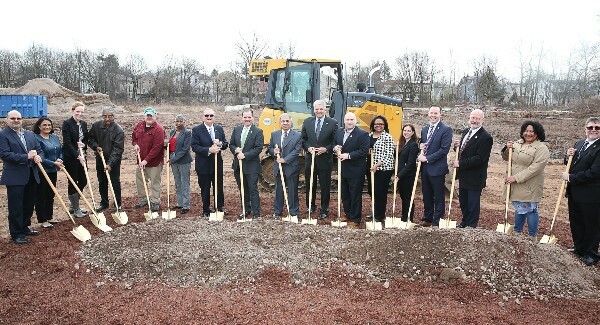 The Township of Bloomfield held a groundbreaking ceremony for the upcoming Lion Gate Municipal Complex project Friday morning, with officials from New Jersey Department of Environmental Protection as well as county, state and local elected officials. The long discussed project will re-purpose the 18.2 acre site of the former Scientific Glass Factory, creating a soccer field, a children’s park and walking paths along Third River. The long-awaited project will include restoring historic and ecologically important wetlands that will reduce the impact of floods in the area, and the soccer field will feature an underground water draining system. The creation of the Complex, one of the largest infrastructure projects in Bloomfield in decades, costs approximately $13.3 million, which includes a $1.7 million Freshwater Wetlands Mitigation Council grant and a $3 million New Jersey Department of Environmental Protection grant. Funding also came from Green Acres and the Passaic River Natural Resources Restoration grants. Also at the event were State Senators Ron Rice and Teresa Ruiz, Assemblyman Ralph Caputo, Essex County Freeholder and former Bloomfield Councilman Carlos Pomares, and the entire Bloomfield Council. “By removing a little over four acres of upland historic fill in this densely developed area and converting it to a functioning floodplain wetland, the project will restore valuable ecological functions, increase flood storage capacity, and enhance wildlife habitat,” said Mark Gallagher, Vice President of Princeton Hydro, the ecological engineering firm contracted by Bloomfield Township. Phase One of the project, which includes the wetland construction and plantings, will be completed by September 1, 2019. A maintenance building, concession stand and Environmental Center are planned as part of Phase Two. Over 500 trees and shrubs will be planted in the new wetland with additional trees and shrubs being planted along Lion Gate Drive and in existing woodlands. The selected native plant species all provide important wildlife value such as providing fruit for migratory birds.